There has also been a change in the acceptance among organized groups of people who are blind, although those groups only represent about 50,000 of the 8 – 10 million individuals who are visually impaired in the US. In the past, some traffic engineers have been caught in the middle of two consumer groups, American Council of the Blind and National Federation of the Blind. The American Council of the blind has been and is in favor of APS at all intersections with pedestrian signals. 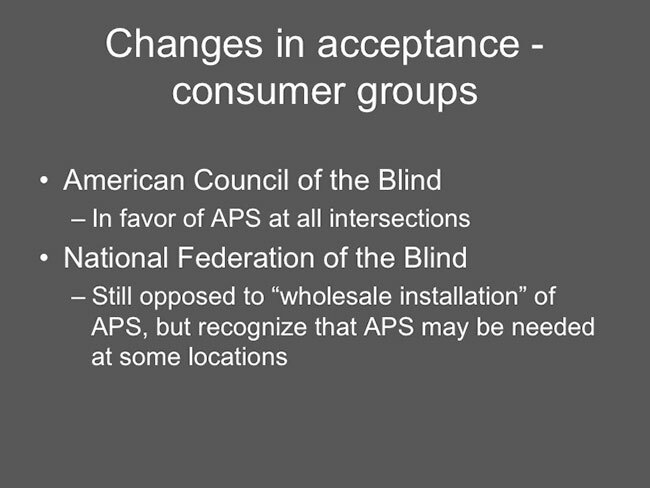 The National Federation of the Blind is still opposed to what they call “the wholesale installation” of APS, but have recognized that APS may be needed in some locations. In their comments on the draft public rights-of-way guidelines, they listed a number of possible situations where APS need might be evaluated, including streets of more than 4 lanes, protected left turn intervals, T intersections or locations with islands, intersections with limited traffic, actuated intersections, or where the speed limit of traffic on at least one street is greater than 45 miles per hour. Many intersections meet at least some of those conditions, so there is somewhat more advocacy for APS among individuals who are blind.